MODfather Still Following His Dreams! – Paul Weller News! MODfather Still Following His Dreams! 2 Comments on MODfather Still Following His Dreams! THERE’S an unspoilt sky over Blackpool and a summer sun beats down on an empty beach. One look at Paul tells you the former frontman with The Jam doesn’t spend much time in inclement climates these days. He sports a perma-tan that would make Paris Hilton blush and wears his 49 years – and today’s rugged-chic look – well. And while the weather may not be the most rock ‘n’ roll of subjects to kick off a chat with the Modfather, it does seem like the very topic to get the ball rolling when you’re meeting a man who oozes Britishness. Image has, of course, followed Weller around as much as his music. With The Jam and The Style Council, and (since 1992) as a solo artist, he was touring the world before I was even in short trousers, but he remains the sharpest looking Mod on the block. So, that’s the weather, tea and toiletries ticked off: all the essentials on the interview checklist. But the real business, of course, is Weller’s new record, 22 Dreams – a 21-track expedition that hints at all of Paul’s musical back catalogue. “I wasn’t particularly that conscious of that,” he says, “whether it was in a sub-conscious way, I don’t know. A lot of the record was just made up as we went along, quite improvised. From the jazzy strut of the title track and the British country of All I Wanna Do (Is Be With You) to the psych-rock of the Noel Gallagher co-penned Echoes Round The Sun and the eerie hip-hop vibe of God (featuring Ian Brown’s former guitarist Aziz Ibrahim), it sounds like the kind of coherent whole an artist could comfortably call time on their career with. “I suppose we spent a lot of time trying to make the tracks sequent into each other and make it feel like a bit of a little journey. It took a year to complete and I suppose it’s a journey through that year of our lives. He still loves making music but the years have made him no more likely to wax lyrical about his new material. As Weller sees it, the proof has always been in the listening; his tour so far has made a big feature of the new record, packing as many of the album’s eclectic tracks in as possible during his lengthy live sets. But he wants to go one step further. “I’d like to tour this record,” he says, “to have a full orchestra and extra musicians and play it all in sequence. “I’d especially like to do that with this one because it’s got so much music on it, it’d be like a complete evening. But you don’t know how things are going to do commercially these days, so who knows? If he had the time, he’d give Wild Wood and Stanley Road the same treatment. 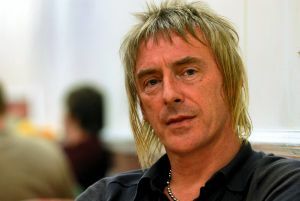 But Weller – a father of five – continues to be a very busy man. As we catch up, he’s in the middle of a sold-out 12-date UK tour and is preparing for a run of arena shows this autumn, which hits the M.E.N. Arena on November 18. “This has been a really creative period for me,” Paul enthuses. “We probably ended up doing 27 songs altogether, and we could have kept going. It just kept unfolding in front of us. “I always say that every record will be my last, because making a record is so creatively knackering and I always feel a bit depleted afterwards. “But, with this record, I didn’t feel that, and I’m kinda looking forward to making the next one. “There’s certain tracks on here that are sort of springboards into the future for me, opening up other places where I can go, you know? Previous Entry The Tour Bus Interview! Next Entry Talking Shop With Paul Weller!